When I was collecting the frames I didn't worry about color because I knew I would paint them all to match anyway. I was just looking for frames that were in good condition, had a nice shape, and had glass (if they have a matte it's a bonus!). By shopping yard sales I saved a ton of money on this project. I didn't spend more than $0.50 per frame! After looking at my inspiration pics, I decided on white for two main reasons. The black frames looked kind of dark and our living room doesn't get tons of light so I didn't want to make it any darker than it already was. I like that the white frame wall worked with color pictures in the frames. I want to be able to do some color, either in pictures, or other art in the frames, and I think black frames on top of that would be too busy. So I got to work painting all my frames. I took all the glass out so I wouldn't have to worry about breaking or painting any of it. I decided to use the white semi gloss I had left over from some other projects. That was a HUGE mistake! If you ever paint frames, I think spray paint is probably the the way to go! It took for.ever. and then I had to do a second coat. And they all stuck to the newspaper anywhere I dripped paint (which was a lot of places. I'm not a great painter.) and ended up being a huge headache. Consider yourself warned. Before I put any frames on the wall, I made a template of each one (using old magazine pages) so I could figure out my arrangement before I put any holes in the wall. I'm embarrassed to say my wall looked like this for a good month (after I decided on the layout) before I finally put up the frames that were already painted and waiting in the basement. I am ashamed. But then my husband had a long weekend off and I decided it was time! So while he entertained Baby B I got to work. ...I was able to mark this spot right onto the templates and go ahead and put my nails up. It was an easy way to get everything hung right where I wanted it. Then I just pulled the templates down and put my frames up on the nails. Ta-da! This is just kind of a dry run without the glass or any pictures in them yet, but I like it already! That one little brown guy still needs painted, I just picked him up last weekend. I'm already glad I decided to go with white for the frames. Nice and light. I even like how they look empty. Maybe I'll leave them like this for a while. I still have a way to go, but at least I've made some progress, right? I really like the frames up the stairwell. Me too! 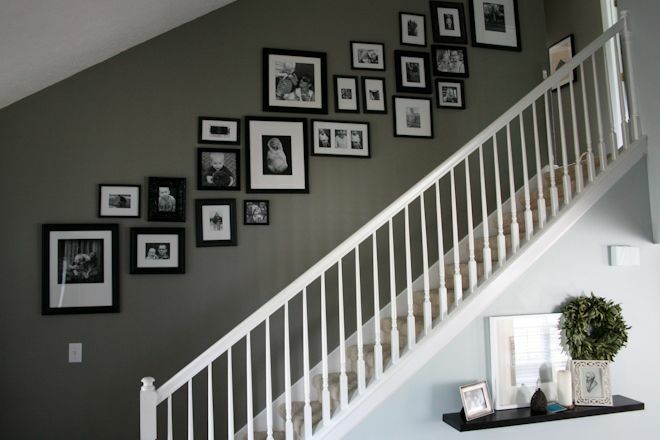 We don't have an open staircase like that, but I'm working on a black & white gallery on the wall at the top of our stairs!